Russian Soyuz rockets could soon be launching from the European spaceport at Kourou in French Guiana. The proposal is part of a package of measures designed to restructure the European launch business and rescue it from its current parlous financial state. On Tuesday, ministers from the European Space Agency's (Esa) member states must consider the plans and decide whether they are worth the requested extra investment from taxpayers and industry of about one billion euros ($1.18bn). 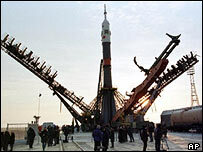 The Soyuz vehicles would have their own pad built at Kourou, with the first flight likely to lift off in 2006. "Soyuz would give us the full range of vehicles to get into orbit," Esa director-general Antonio Rodota told BBC News Online. "Smaller payloads will eventually travel on the Vega rocket; the larger satellites will be lifted by the Ariane 5. "The low-cost Soyuz can lift medium payloads into low-Earth orbit and geostationary obit. It would also give Europe a manned spaceflight option." But it is imperative that space ministers first put in place measures to strengthen the market position of Europe's main launch vehicle, the Ariane 5. 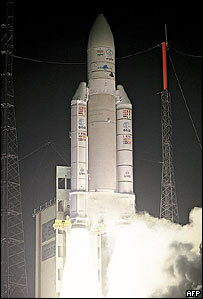 A beefed up version of the rocket, the 10-tonne Ariane 5, exploded four minutes into its maiden flight in December, dumping two satellites worth 600 million euros ($709m) in the Atlantic. The cooling system on the rocket's new Vulcain 2 engine failed and it must be redesigned and flown on two qualification flights before payload opportunities can again be offered to customers. This recovery programme alone will cost Europe a quarter of a billion euros ($295m). 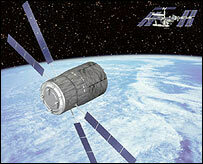 It is envisaged the first qualification flight would be in March 2004; it would carry a dummy payload. The second flight, in the September, would undertake an altogether more onerous task - that of launching the first Automated Transfer Vehicle (ATV). This new "cargo truck" is intended to ferry supplies to astronauts living on the International Space Station. There is a shake-up also for the way the whole launch operation is managed. Arianespace, the company charged under a convention with Esa to operate Europe's rockets, is being asked to concentrate its efforts more on the marketing side of the business. In future, development and manufacture will be the sole responsibility of aerospace giant EADS. Arianespace would essentially just purchase rockets - Ariane 5s, Vegas, and Soyuz vehicles from Russian company Starsem - and launch them for customers. All the changes, together with substantial new funds for Arianespace after a recapitalisation of the company, are intended to carry the European launch industry through its current slump. Worldwide, there are too many rockets chasing a small pool of satellite contracts. The current state of affairs has seen the two major players in the US, Boeing and Lockheed Martin, discuss a joint venture. Commenting on the upcoming ministerial meeting, Philippe Camus, president of the Association of French Aeronautic and Space Industries (GIFAS), said: "The space industry expects that France and all the other European states are going to take measures and decisions that safeguard the public and private investments that have been made over the past 40 years." Mr Camus told La Tribune that industry was prepared to do its bit to safeguard the future of Europe's independent launch capability but that the member states of Esa had to share the burden.